The "Colectivo Ecologista Jalisco" undergoes different activities meant to make citizens conscious of the environment that surrounds them in the city. One of them is the interpretative walks: a guided walk around certain area that allows participants to understand how nature has found a way of co-existing with the urban landscape. During 2014 one of this walks was planned with a local modern art museum as part of their Sunday family activities. This walk had a special focus towards how trees survive in the urban environment. 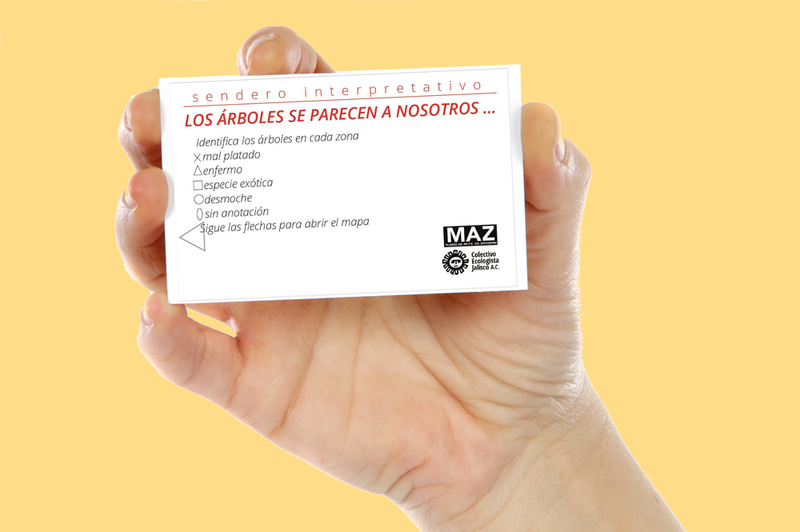 To accompany the experience a site specific analog interactive map was designed. "Los árboles se parecen a nosotros" / "Trees are like us" was the name of this tool. Part of the exercise participants took part of, besides observing, was distinguishing some characteristics of the urban forest's challenges. So in each of the folds a table was included allowing people to register the issues observed during the walk (badly cut tree, exotic species, sick tree etc..) These sightings were then compared with the rest of the group at the end of the walk.